Technically, the weekly cycle low occurred on 10/29/2018. It has been 4 weeks now since the weekly cycle low. 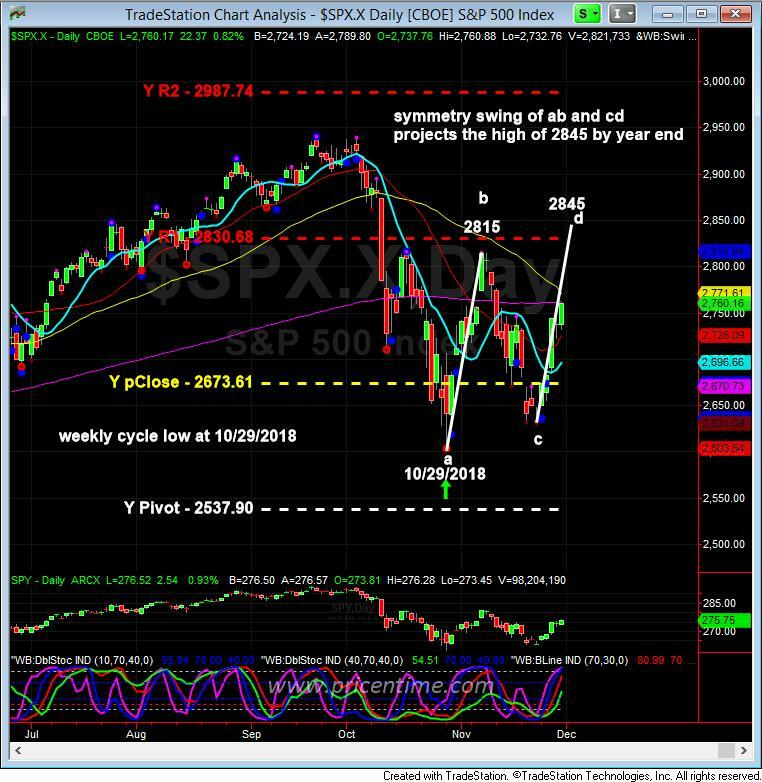 Inside the weekly cycle, the market has produced a daily cycle that occurred at points of a,b and c. The b high at 2815 is the 61.8% retracement of the weekly cycle high to low. There are two camps of the expert opinions about the market direction right now. One camp is very bullish and believes the market’s trouble is over and a new high is within sight. The other camp is bearish and believes the market will have trouble surpass the high at 2815. It will be 8 weeks in the current weekly cycle by year end. The remaining 4 weeks in 2018 will give the market the time needed to finish a second daily cycle. If the market were to produce a symmetry swing of ab, it will produce a high of 2846 by year end. 2845 high is also the 70.7% retracement of the current weekly cycle high 2940 to low 2603. The odds of a symmetry swing cd by year end is very high. The market has the ability to confuse the maximum number of people. By surpassing the b high at 2815 it will present a very bullish picture and trap longs. Because overcoming the b high at 2815 will convince people that the market’s trouble is over. It is in our opinion that the market is still in the 4-year cycle high to low phase. The present news doesn’t change the fundamental problems with the market. The tariff has already damaged the economy. The earnings revision of 2019 will show the real picture of the economy, but right now the investors’ sentiment and the holiday seasonal effects will drive the market to produce at the high of 2845 to finish 2018. Our suggestion is to go with the flow with caution. It is okay to open positions in anticipation of the target of 2845 by year end. The leading sectors are consumer staple, healthcare and utilities. The leaders further confirmed that the current environment is risk off. The funds are moving their money to safe areas. AMAT seems to have hit the bottom at 30.53 on 10/29/2018. It took 7 months to hit this low. In the previous 4-year cycle, AMAT took 8 months to hit the first low and additional 6 months to hit the final low. So we are cautiously watching AMAT to finish the bottoming process. It may take additional 6-7 months for AMAT to be finally done if this current cycle is similar to the last one. Again, we use AMAT as the leading indicator for the general market. There is no broad bull market without the participation from the semi-conductor sector. This entry was posted	on Sunday, December 2nd, 2018 at 9:01 pm	and is filed under Forecasts, Stock Indices. You can follow any responses to this entry through the RSS 2.0 feed. Both comments and pings are currently closed.